Today was my second lesson this week! I cannot remember the last time I’ve ridden twice in a week, but it was probably in college. I wasn’t sure how I’d feel having ridden just three days ago, but I felt great. I noticed that I warmed up a lot more quickly today than usual. I can only imagine how I’d feel if I rode even more days a week. Another thing that made me feel great was that today I rode for the first time in my new helmet. I’ve had the old one since college and ever since the interior padding disintegrated from sweating it in for years, it hasn’t fit me properly. To compensate, I have been putting my very long, thick hair in a bun and using that to hold it in place. But that a) hurts my head and b) sometimes comes loose. That happened last summer when I took a fall. My helmet protected me when my head hit the ground, but it also slid forward on impact and hit the bridge of my nose, nearly breaking it. Finally, it’s recommended that you should replace your helmet after a fall if it hits the ground, even if it appears undamaged. And mine was long beyond the 5-year-old mark past which it is recommended to replace your helmet anyway. So it was definitely time for a new one. 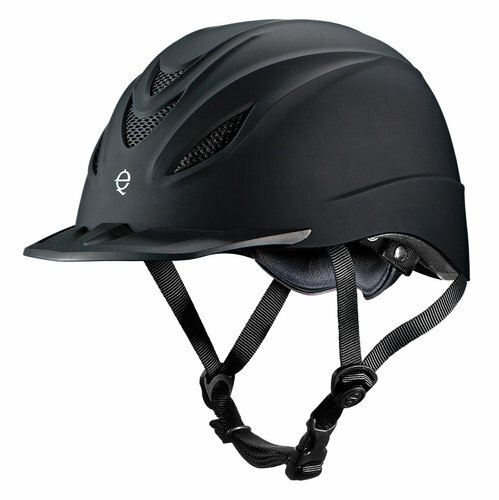 I went with the Intrepid by Troxel. It was affordable and it also had some features of particular interest to me. First, it has a cinch system that makes it easy to adjust it to exactly my head size and shape. It’s also very low-profile and lightweight. Those are great things for me since I have a really tiny head. A proper fit is imperative for safety and I don’t have to go around looking like I’ve got a big ol’ heavy salad bowl on my head. It also has air vents, which is an incredible improvement on comfort after years of a fully-covered velvet cap. After the first ride, I have to say I’m pretty satisfied with it. I think its lightweight design also made it easier to balance my body without my head coming too far forward. I feel much less neck and back strain than I sometimes do after my lessons. 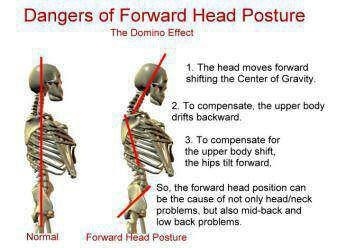 Consequences of incorrect head posture. In addition to those improvements wrought by getting better equipment, the lesson itself was also quite fun. I rode Jackie O. today, the little appaloosa mare I rode once before in a fun and challenging flat lesson. We did a course book-ended by two lines on the long sides, similar to the one in my lesson on Tuesday. But instead of just a diagonal plank jump in between, there was an in-and-out. I had less trouble today with my spots than I did on Tuesday. Jackie is more experienced and savvy than Bella, which helped, but I also had a clearer mind today. The first couple times through on the first line, I again didn’t have enough impulsion going in. Jackie loves to add a stride, so we got in deep and had to push to get out. She built from there, however, so the in-and-out and the final line were forward and clean. I thought about this tendency to not have enough speed going in for the last two lessons and wonder if it’s a control issue. I know that I felt I was pushing Bella last week to go forward and just wasn’t getting anywhere, but then I felt that this week on the more-responsive Jackie and still had similar results. I suspect that I’m unaware of body language that is contradicting my leg. 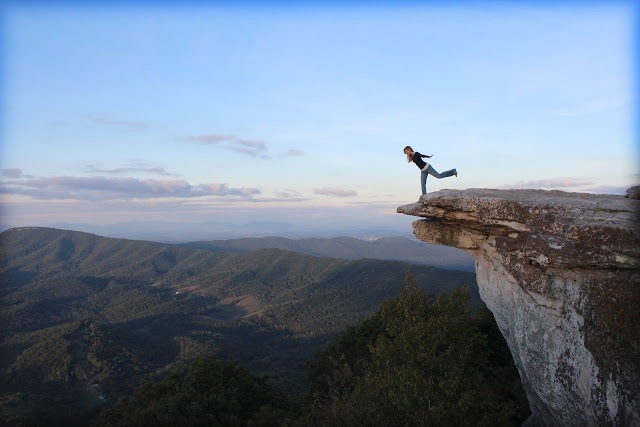 Really it comes down to the fact that I’m over-thinking the jumps and being too controlling. When I ask for the canter at the beginning of the course and on the approach for the jumps, I’m taking too much contact and making the canter too collected. Because I’m uptight in my head about the spots, it’s as if I feel that a very collected canter will make me able to pick the perfect spot–but that’s not the case. It’s the fluid motion of the rider and horse together that make the spots feel natural, not this clamped-down nonsense. On the final line, once we had really gotten moving, as horses tend to build speed throughout a course, I was able to just go with it and that one was beautiful. The last time through the course today, the trainer encouraged me to push Jackie forward before the first line. I did that, but I also kind of mentally let go. I still retained contact and my mind was still focused on riding my horse down the line, but I wasn’t trying so hard. Not being so much in my head allowed my body do what it needed to do (including breathing). You don’t think rhythm, you feel it.